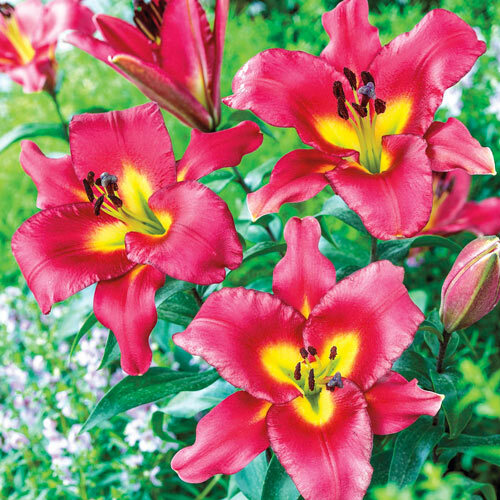 For the perfect plant to anchor a sunny bed or foundation planting, consider the statuesque and striking Giant Orienpet Lily. This gorgeous variety, Satisfaction, features deep raspberry-pink blooms accented by sunny yellow hearts. Not only does it bestow magnificent color and beauty to the landscape, it also grows up to 8' tall within three short years! The beautifully fragrant blooms are outward facing with slightly recurved petals, and grow in abundance up the tall, sturdy stalks. They make outstanding cut flowers, ideal for adding interest to fresh floral arrangements. Plant in full to part sun at the back of a border, in a cutting garden or as a privacy screen. Satisfaction attracts butterflies to the garden, which benefits the entire landscape. Outward facing flowers, 8" in diameter.